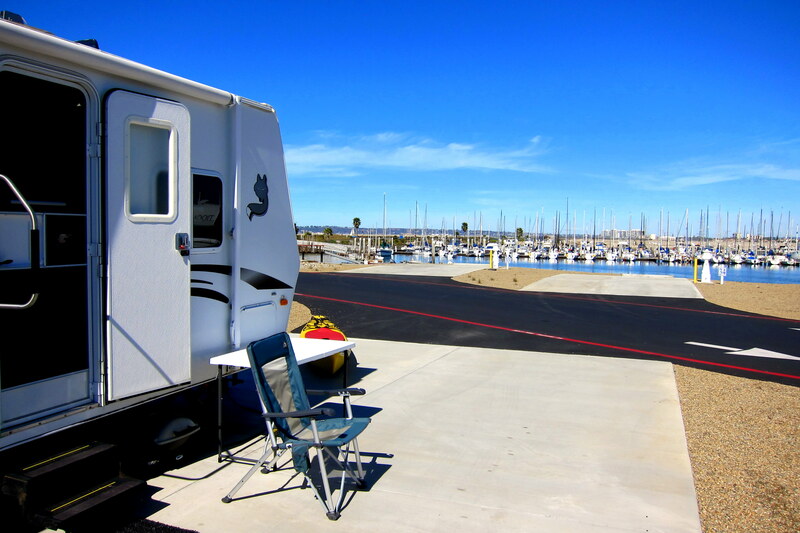 Sunday, February 23 through Friday, February 28, 2014-Del Mar Beach, Camp Pendleton in Oceanside, CA: This is the second year in a row that we have stayed at this RV Park. 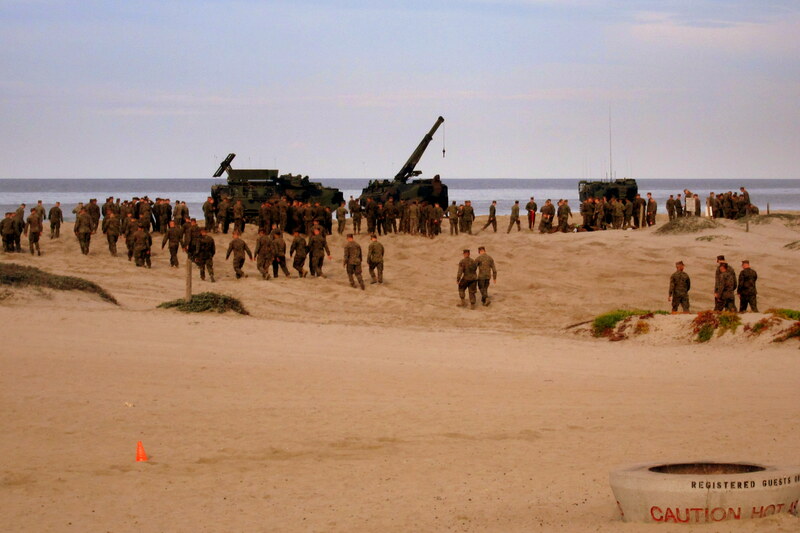 It is smack dab on the beach and provides daily displays of military might as the young Marines head out on training maneuvers. This year we have additional family that has returned to the old home state following a number of years as Texans. 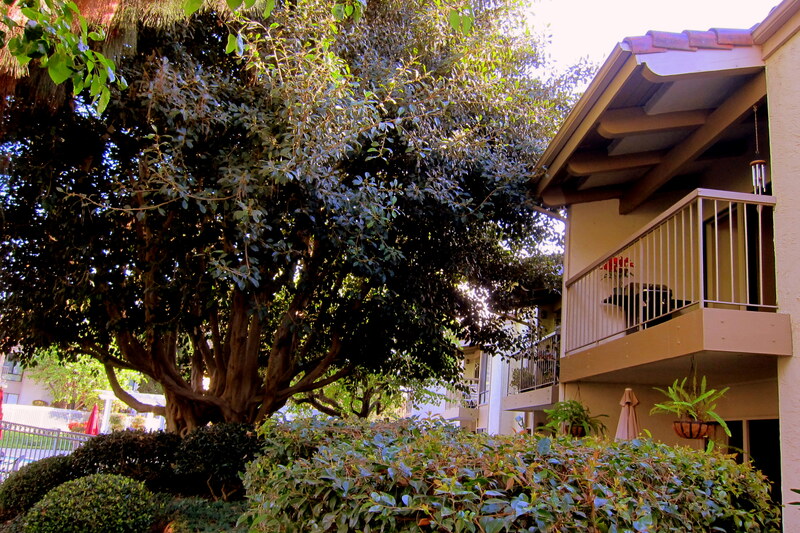 Kit’s sister Charlotte and her husband Donald have purchased a condo in North San Diego County. 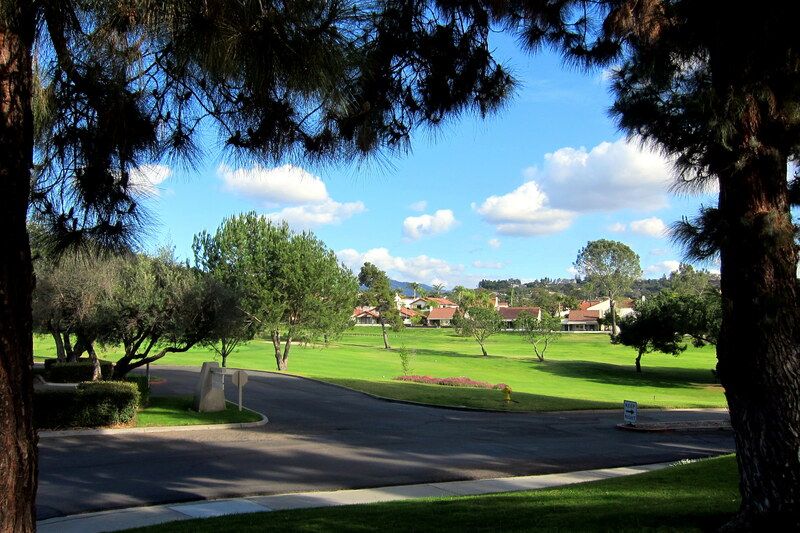 Their new place is in a beautiful senior development that contains many amenities and activities. There are a couple of swimming pools and hot tubs, a golf course, and various craft rooms…..all on nicely landscaped grounds. The trees and bushes were vibrant green and the flowers were in full bloom. Kit was so impressed she took some time from the visit with her sister to add a little something to the flower beds. Don and Char still have their home in Texas Hill Country and we hope to see them for a more extensive visit during our return trip toward the right coast next month. 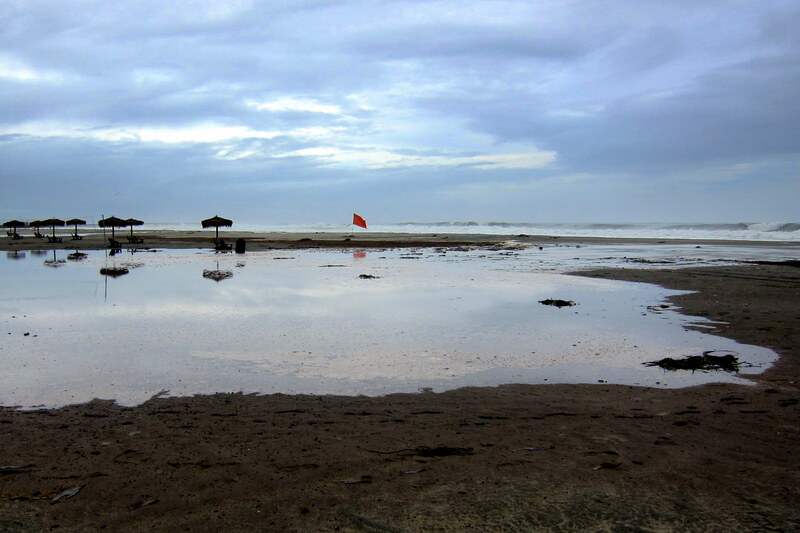 The large sparsely populated beach of our campground coupled with the nice steady onshore sea breezes made for perfect kite flying, an activity I enjoyed pretty much every day during our stay. 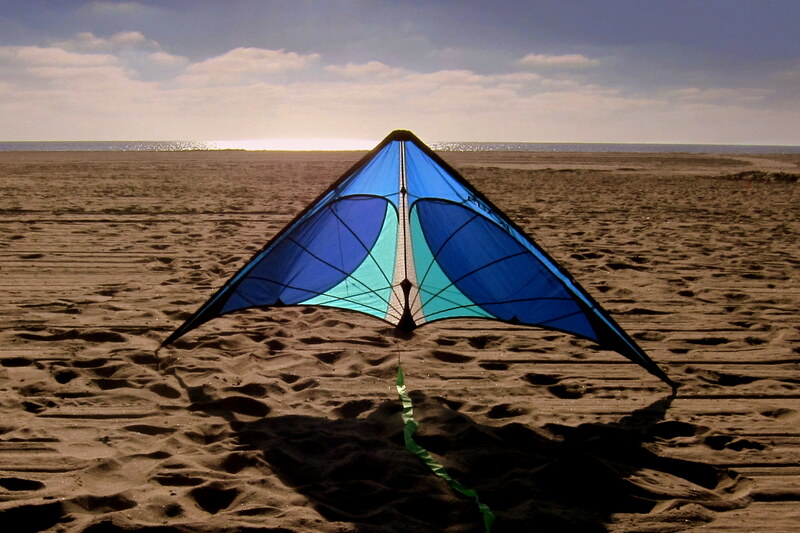 My new kite (geez, not ANOTHER one, kt), which is a midsized, light wind, high performance, delta stunt kite was used more than others in the quiver. I’m attempting to learn some low elevation tricks. 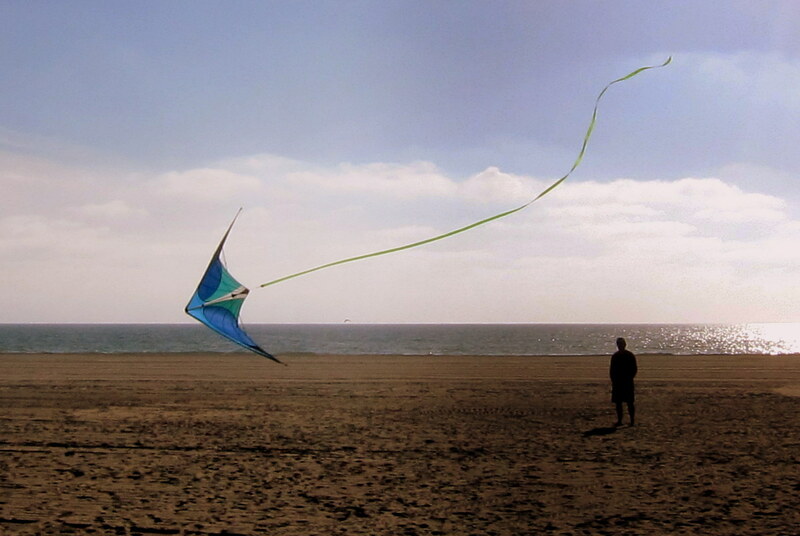 This kite is mostly indestructible, which is a good thing as I end up playing lawn darts with the thing many times each day as it rockets nose first into the sand. The high velocity impact is so severe that the impact shock can be felt in the control handles! My much larger, but significantly lighter delta kite would have been a crumbled pile of expensive carbon fiber the first day so this new kite is actually saving me money…..honest, Kit! I never get tired of taking photos of California sunsets and hope you all don’t get tired of viewing them. I read somewhere in a photography book that it is virtually impossible to take a bad sunset photo, and I truly believe that. If you look carefully at the above photo you can barely make out my bent over shape as I struggle once again to dig my new kite out of the sand……Charlie Brown would be proud! Another person we wanted to visit while in the area was to a former high school classmate of ours who lives in Huntington Beach, about 60 miles up the coast. 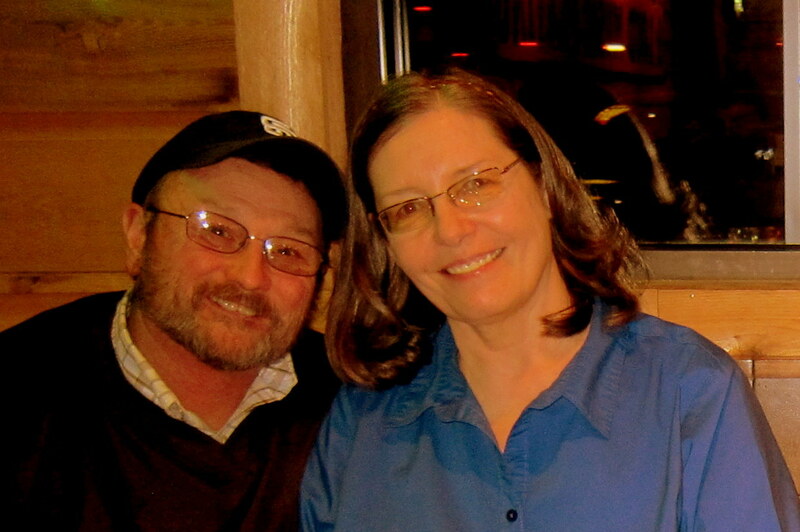 Susan lost her husband late last year, and recently suffered a fall that injured her shoulder. However, with everything going on in her life she was very gracious in allowing time for us. We had a great visit at her home and later went to a local restaurant for dinner. I know you read these journals Susan…..please remember we are thinking of you and call if you need anything at all. About mid-week we started seeing reports of a major winter storm heading in from the west. I was having trouble deciding if I should hook up the truck to the trailer in order to make a quick getaway or place the truck on the windward side of the trailer to help protect it…..as you can see I decided on the latter. 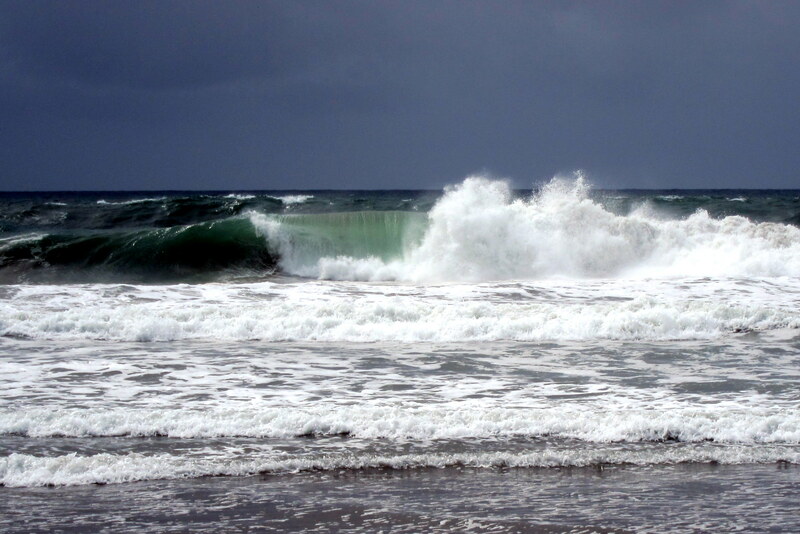 As the wind velocity increased, the seas became choppy and the surf grew in size. Checking the NOAA Radar App, I came to this rather alarming image. 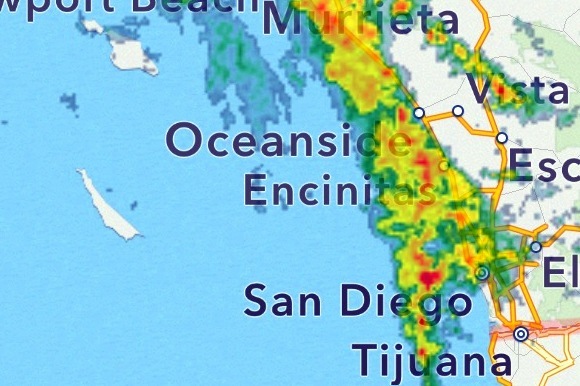 In these color coded radar videos, anything in yellow is bad ju-ju and the areas in red are even worse ju-ju…..and um, notice where Oceanside lies! These radar returns showing severe weather were lined up one after another out to sea for many miles. It was going to be an interesting couple of days. The storm actually lasted for the better part of three days with intervals of relative calm until the next front came ashore. That sensation was very similar to the hurricanes we lived through while living in Key West, Florida during the mid-1960’s. As the eye of the hurricane passed over the island all would become calm and sometimes the sun would actually shine through. It was common practice for the folks sequestered in the hurricane shelters to pour outside and get some fresh air. Well, reliving my dumber younger years, during the lulls in this storm I bundled up in rain gear and walked along the shoreline to see what the storms effect may have been. 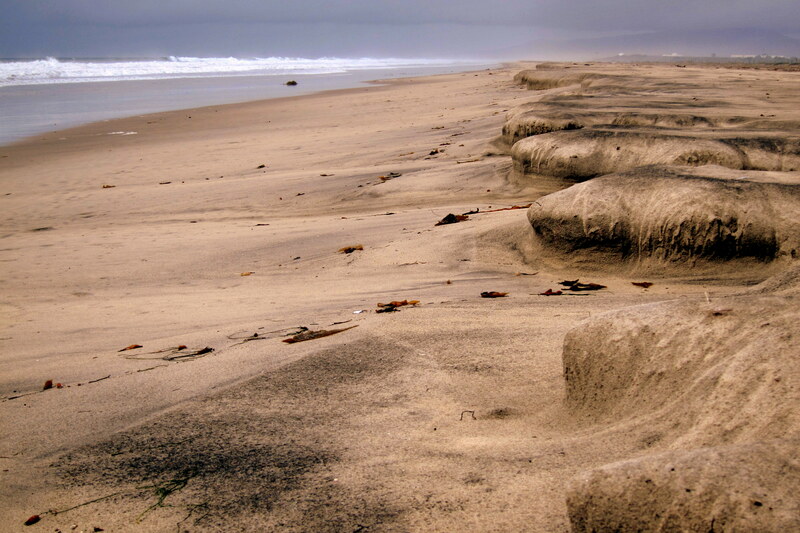 The erosion produced by the pounding surf was pretty dramatic. 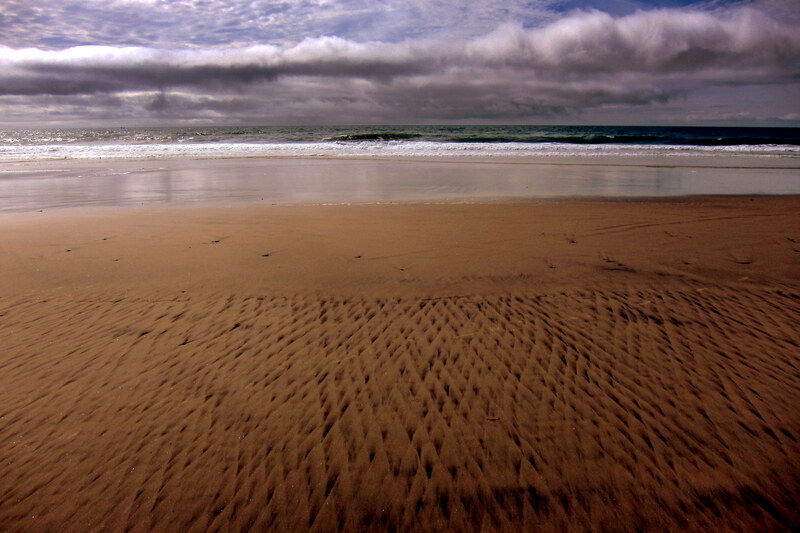 And in the photo below, notice that the sand had been scarred by the relentless winds to the point of creating interesting geometric shapes. While I was slowly walking along that cool morning, I kept my face down to shield my eyes from being sandblasted by the strong wind. Then, in the distance, I faintly heard someone calling cadence. Turning my back to the onslaught with all my heavy weather clothing flapping violently in the wind I gazed upon a platoon of Marines running up the beach dressed only in OD T-shirts and fatigues! 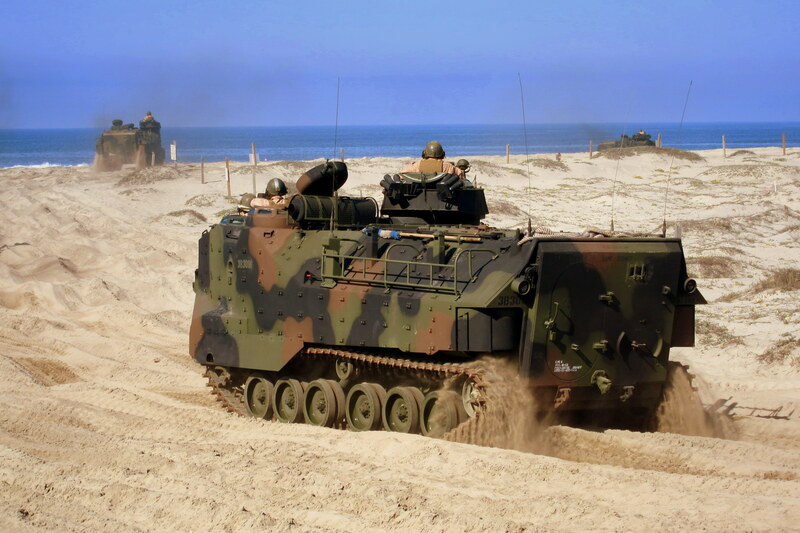 OK…..I’m convinced US Marines are pretty damn tough! Soon the wind speed increased dramatically. 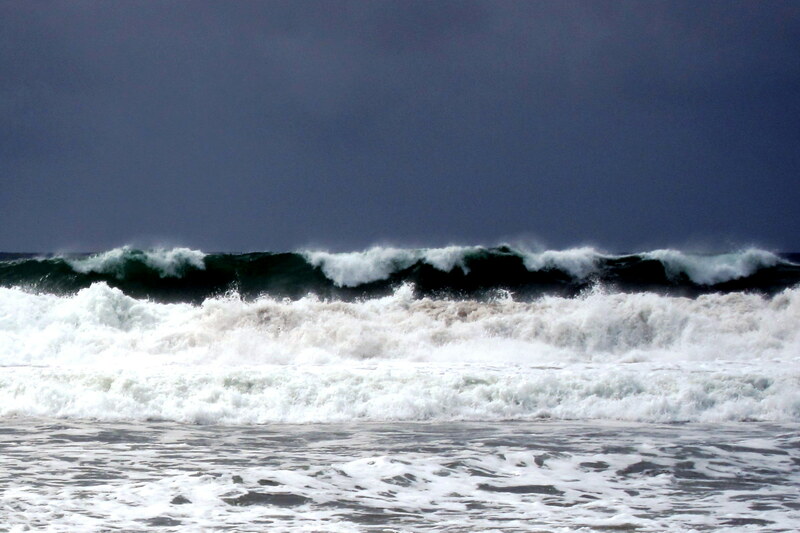 And the seas, pushed by a predicted astronomical high tide began to grow once again. Having a modicum of intelligence, I decided to retreat to the relative safety of the camper. We endured two full days and part of a third of this onslaught and nights were spent being rocked in our little trailer by the relentless winds. However, at no time did we feel in any real peril. Our camper is pretty stout and quite heavy for its size. In addition, it sits lower to the ground than most trailers due to the absence of any slide out mechanisms. During late afternoon of the final day of the storm the setting sun peaked under the clouds and provided us this spectacular horizon to horizon rainbow, as if Mother Nature was saying, “sorry about all that, folks”. And as the sun lowered into a clearing and calming ocean we were treated to another in a series of spectacular sunsets. All was well in Retiree Ville once again! Before we head out tomorrow, we just want to give a shout out to an old (pun intended) friend from back home that celebrated his 80th birthday on February 28th. 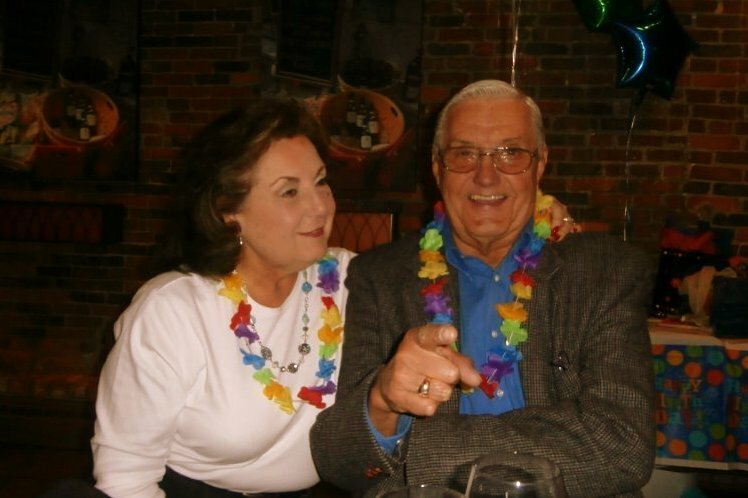 Chet, shown above with his much younger wife Jeanne, is the honorary Patriarch of a ragtag group of Lockheed pensioner’s that get together on a regular basis to eat, drink and complain about stuff. Happy Birthday Chet…..sorry we missed your party. Saturday, March 1, 2014: Well we were supposed to depart this morning but the California Highway Patrol has not lifted the high profile vehicle advisory due to continuing high winds. Since we want to head south, and since the winds are coming from the west, and since we aren’t in any big hurry anyway, we thought it advisable to heed the warning and just stay put. The bonus day was spent trying to clean the salt and sand out of the nooks and crannies of our truck and trailer…..a job that will likely take a few weeks to accomplish thoroughly. The delay also gave us the opportunity to enjoy more of the Marine Corps in action…. 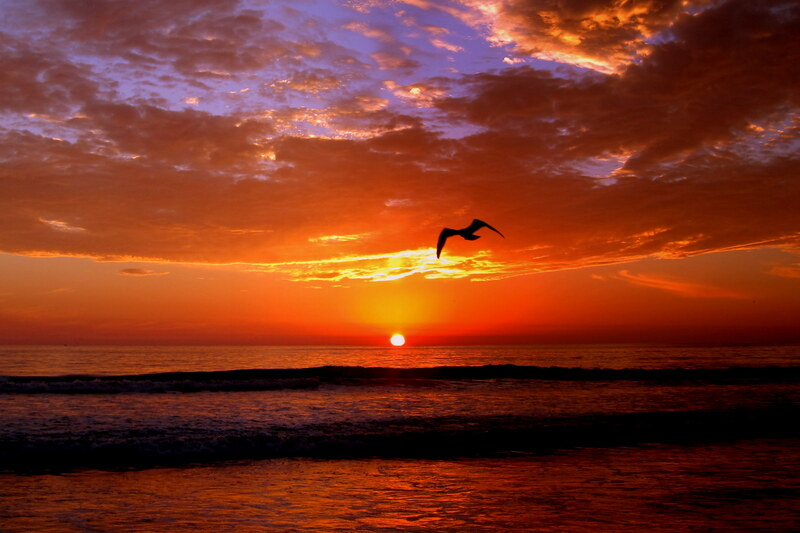 …..as well as another spectacular sunset! Sunday, March 2, 2014: Woke to mild winds and rising temperatures. Taking my morning walk along the beach I noticed that the tide had been particularly high over the evening and had flowed into a normally dry area of the beach. The rising salt water had stopped about 35 feet from our campsite. 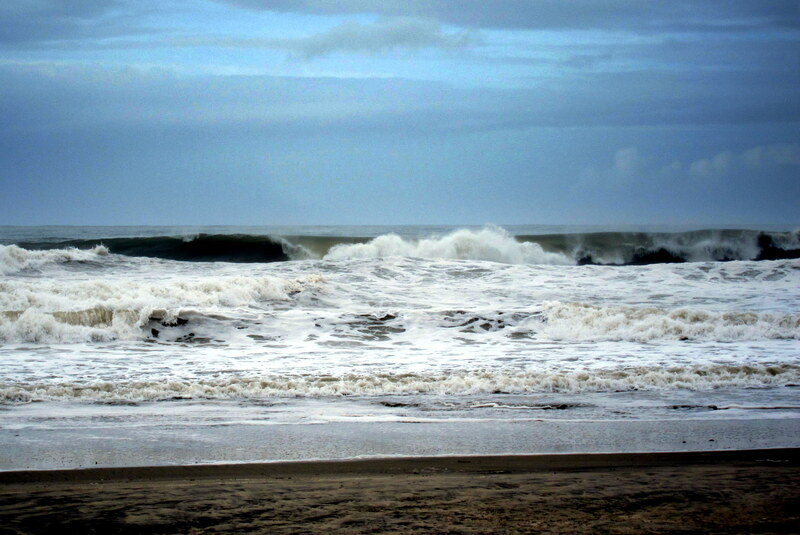 The wind had moderated substantially but the surf has remained quite high. 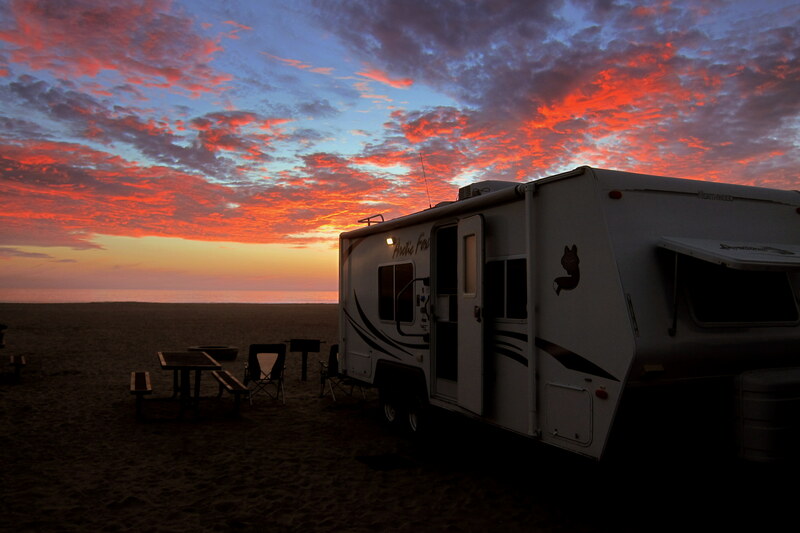 We broke camp and headed out at 1125 for the long trek south to Coronado, 44 miles to the south. On our way out, we noticed a lot of debris from the recent storm and many branches and palm fronds scattered about. The normal and most direct route to our destination is I-5 (The5) through San Diego, cross the bridge over the bay to Coronado. However, having plenty of time and not wanting to drag the trailer through downtown traffic, we opted to pick up I-15 (The15) in Escondido and stay more inland. 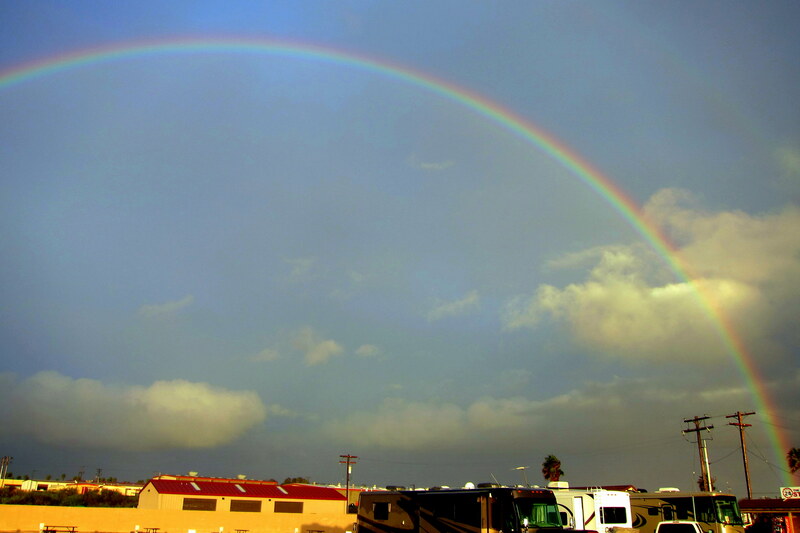 This led us to Imperial Beach were we took CA-25 up the Silver Strand to our home for the next two weeks…..Fiddlers Cove RV Park. Pulling in we received a rather unusual and extravagant reception. First we were hailed by a rather dapper dressed gentleman in a straw hat who told us where the office was. Then we came upon this sight. There were folks dressed formally and a small US Navy band performing nautical music including Anchors Aweigh! 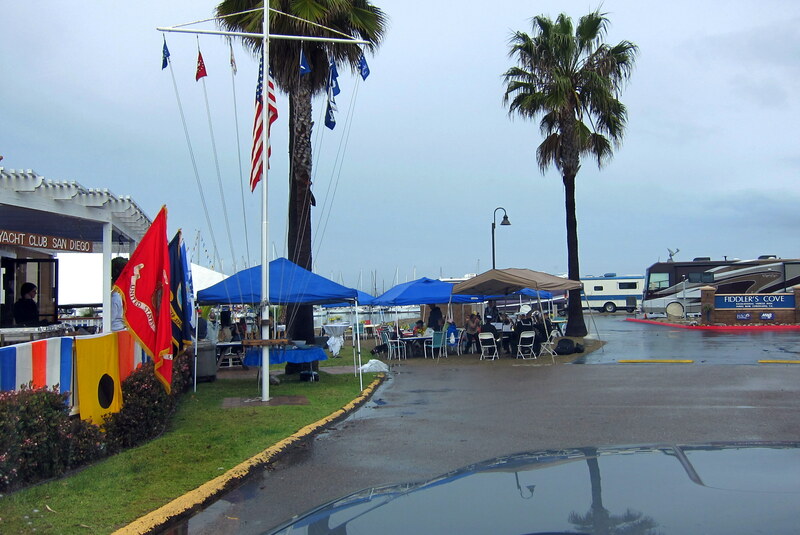 Soon we realized this show of pomp and circumstance had nothing to do with us but was a celebration of the seasonal opening of the boating season and was put on by the San Diego Navy Yacht Club which inhabits the large marina adjacent to the RV Park. 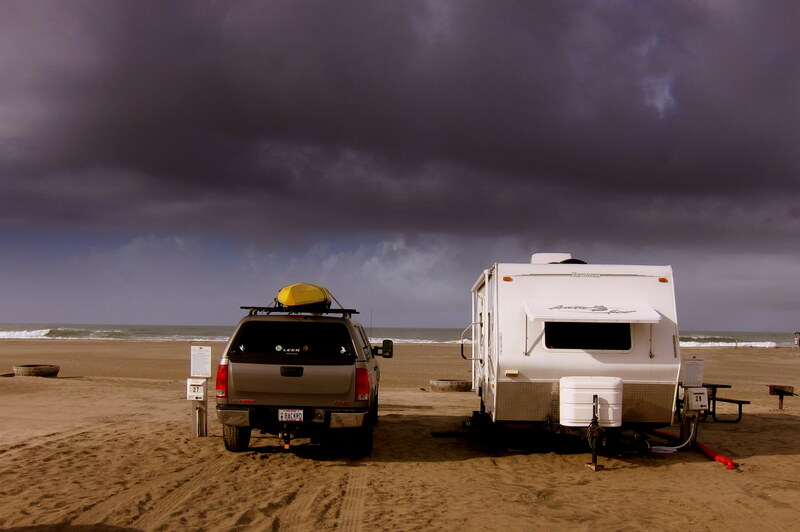 Settling into our nice campsite overlooking the yacht basin, we made a list of things to do while in the area. This year’s trip to our hometown we have decided to essentially play tourist and enjoy what others do in this great American city. 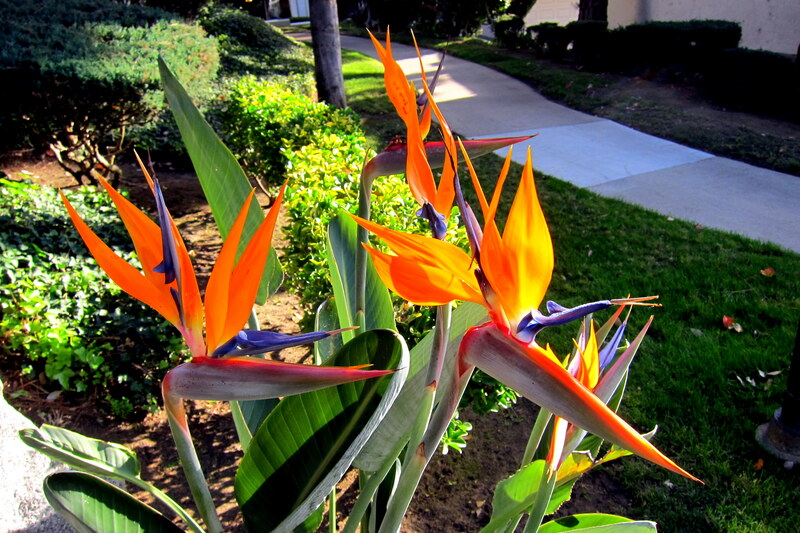 Kit’s Bits: We had a lovely time at Del Mar Beach this year. Even the big storm was exciting! Having spent a fair amount of time at the beach when we were teenagers, it’s always nice to return to SoCal and stay on the water. Not quite as comfy as a fancy hotel, but just as nice in my opinion. Since Bill carries all his “toys” along, he can always find something to do and we both enjoy watching the Marines training. Some of the campers actually complain about it but we love it. Often, they will walk or run right through the camping area and are always so polite and friendly. Love the pics and your story-telling! Happy trails…until next year! 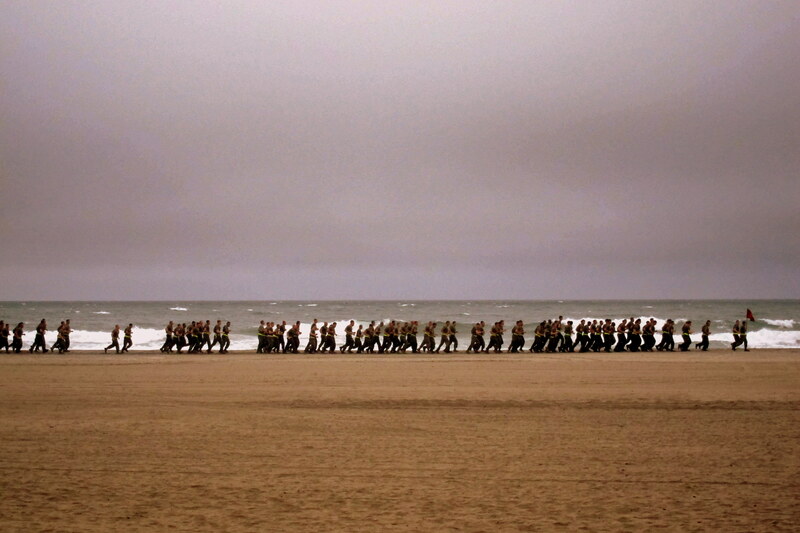 I WOULD HAVE JOINED THE MARINES HAD I KNOWN I MIGHT TAKE BOOT ON A SUNNY BEACH IN CAL. WITH MY LUCK I WOULD HAVE ENDED UP IN CAMP LEJUNE NC. AS LUCK WOULD HAVE IT, I BOOTED IN A SAND BOX AT FT DIX IN NJ DURING JANUARY, FEBRUARY AND MARCH 1955. PRETTY CHILLY HERE TODAY AND WE JUST MISSED A BIG SNOW EVENT THAT WILL BURY DOWN EAST MAINE TODAY AND TONIGHT. SINGLE DIGIT NUMBERS FOR TONIGHT AND TOMORRA. I HAVE DAFFODILS THAT HAVE STARTED TO BUD RIGHT NEXT TO THE FOUNDATION ON THE SOUTH SIDE. POOR FLOWERS, I HAD TO GET THEM SOME LEAVES SO THAT THEY MIGHT MAKE IT UNTIL THIS COLD BREAKS. 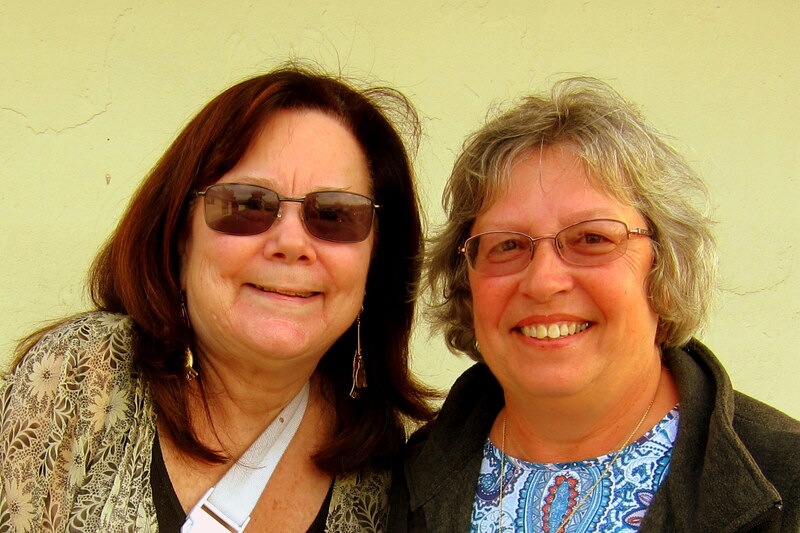 WE ARE PICKING WINDY AND NAN UP ON APRIL 3RD IN PORTLAND. THEY SEEM TO BE ENJOYING THEIR STAY IN HAWAII. WE DID GET THE SAD NEWS ABOUT YOUR MOM BILL. STAY SAFE, STAY THERE!!! HAVE FUN. Bill so sorry for your loss…..my sincere sympathy to you both. Take care you guys, travel safe. The calendar says it’s spring but old man winter does not want to leave…..take your time coming back to Maine, even though I’m looking forward to seeing you….thoughts of ipoa are swirling around in my head but it has to warm up. Especially great pictures this time! 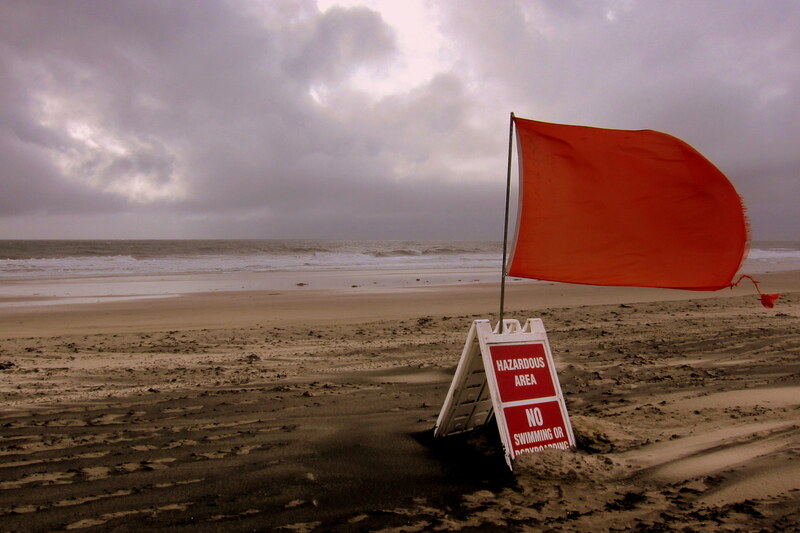 From kite, to sunsets, to high surf, to Char and Don, etc., etc. We have to see the west coast sometime. Correction…I have to see the west coast sometime. Sterlin already has, many times. Looking forward to seeing you. Hope Maine thaws before we all get back there! 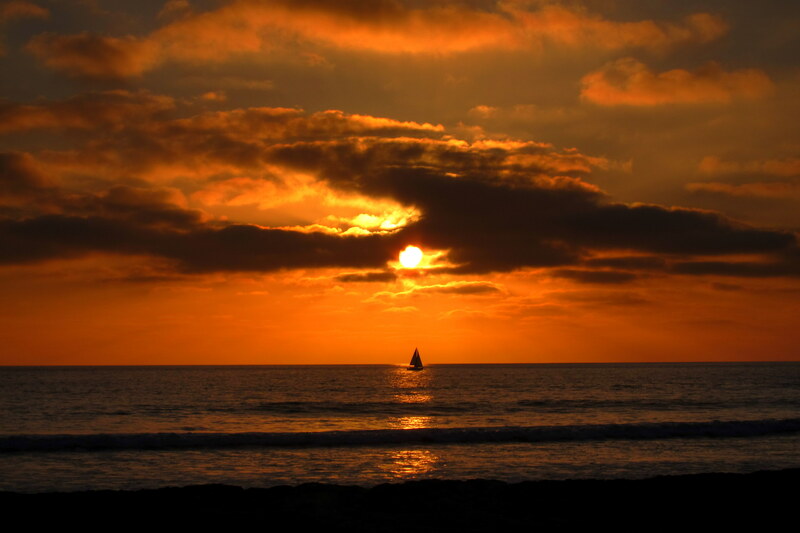 Love your March 1 sunset picture with the sailboat in the distance. That could be a postcard. Thanks you for the nice comment. In reality, that photo was pretty much dumb luck. Happened to be snapping pictures of the sunset when the boat just came cruising by.